This marks my final official 'American in KPop' post. However, fear not -- The artists covered within this post (as well as the artists I previously mentioned -- Rain, BoA, Se7en and the Wonder Girls) will continue to see coverage on Melismatic as seen fit, particularly in BoA's case. Therefore, I should mention -- 1) it was recently announced BoA's seventh Japanese album will be released soon, and is expected to mostly adhere to the R&Pop sound of her American debut, 2) the Wonder Girls are officially (but temporarily) down one member, who is deciding to pursue schooling. They have already found a replacement, and have announced they will soon return to tour the US in the next few months in support of their American album release, opening up for (once again -- killer marketing, these girls have) Justin Bieber (hold your screams, tweens!). Behold: The Boy Band as *NSYNC left it, except Korean. Their name roughly translates to Rising Gods of the East, and is appropriate. If you frequent Nikki's site, you can take a stab at why I checked them out -- and I couldn't be happier I did. They are arguably one of Korea's most successful acts period, and are currently enduring some difficulties related to their label. Their most recent released, "Break Out" (as Tohoshinki...therefore released just in Japan -- trust me, their labeling gets ridiculously confusing) is a fun little pop romp, indeed, and gets better everytime I hear it. 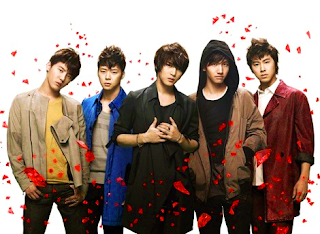 However, it was their most recent Korean album, Mirotic (released in 2008), that got me hooked. They may be notated for their strong harmony (which is hardly anything to scoff at), but for me, a boy band doesn't get better than when it's dancing and strutting its stuff. Mirotic comes hard with "Wrong Number", "Hey! Don't Bring Me Down" (that snap! beat is unrelenting) and "Mirotic" (quote me on this now: listen up, V Factory or One Call -- preferably the latter, more because they are more of the dancers of the two, and something tells me one of the Menudo exes could totally do Changmin's bridge "scream" supreme justice -- it still gives me goosebumps everytime -- cover this song in English. Please!) that are sure to get you up off your seat, and salivating over their impressive dance routines. They may have only come on to the scene during the summer of 2009, but the KPop scene currently would be nothing without the swagger contained by the four chicks in 2NE1 -- they've made a huge dent in the market in such little time. If any current KPop artist had a prayer of making it in the US based on appeal alone, these girls are it. In addition to competent vocalists, they are dynamite performers, and have a sound that screams international appeal. Take a listen to debut single "Fire" once and if you aren't hooked, you are missing something in your ever-loving pop genes. The song positively drips in hooks, with a new one hitting you smack in the face at full force every few seconds. Couple that with that heavy-handed backbeat and you've got a hit on your hands. Their followup, the mid-tempo "I Don't Care" swings with an almost reggae kind of feel, and has a similar retro sound that seemed to work for the Wonder Girls. In my personal opinion, it would sound super fierce on American radio sped up just a tad with a male call-and-response (somebody page Colby O'Donis or something). America -- it's time to pay attention. The group has released three singles since their debut, but for me, it didn't get better than their debut, the melodically sweet "La Cha Ta" (nonsensical, even in Korean) -- and even that took some time to grown on me. Once it did, I could begin to appreciate the group for the vocalists foremost that they are. Second single "Chocolate Love" (a promotion for the LG Chocolate phone, coincidentally), although a bit too sparse and beat-dependent, isn't too bad, either. However, whatever progress they made with me disintegrated borderline completely with third release, "Chu". ::sigh:: Back to the drawing board. 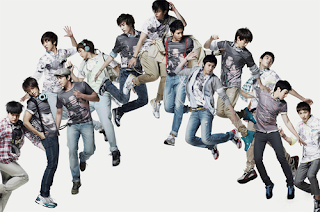 As the reigning Largest Boy Band Ever, Super Junior can boast the fact that not only have they released albums as a 13-member group (three, in fact, with a fourth on the way), they also play house to a myriad of "sub" groups, featuring a handful of their thirteen members that perform on their own as a separate unit. All of the subgroups feature "Super Junior" in their title. I've heard a little bit from all of their various catalogue versions, and so far, only one song has stuck out to me. "Sorry Sorry" is textbook catchy pop (mostly because "Sorry" is repeated over and over and over in a semi-monotone chant during the chorus until you can't get it out of your head if you tried with a sledgehammer. Twice.) complete with fun auto-tune acrobatics. However, if you like your boy bands super slick with their dancing, I suggest you check out DBSK or 2PM instead. Just saying. The group has released two studio albums with a third on the way, and two mini-albums. They broke through as a female counterpart to SuJu, with "Gee", which turned me off so fast, I can't even begin to explain. It was a mixture of it being far too cutesy, and taking the typical Korean pop song's penchant for repetitiveness to a nauseating level, to the point that I needed some Pepto Bismal. Then came last year's "Tell Me Your Wish (Genie)". The cutesy factor is no longer in your face, the background is more synthy and dark, and the chorus is insanely catchy. The jury is still out on their latest offering, "Oh" (soon to be released), but even if they never released another single, "Genie" is enough to groove to. Trust. While a handful of the members are familiar to the KPop public thanks to a co-ed group boy band Supernova, T-Ara is beginning to gain a foothold on their own terms. Their style is markedly more mature than the majority of their counterparts in the KPop scene. Debut single, "Lies", didn't do much for me, however, the more mid-tempo, laid-back "Like The First Time" is piquing my interest. "Bo Peep Bo Peep" was a precarious border between being frustratingly annoying and catchy. Therefore, I'm a little stuck as to where I stand with them. They won last year's Golden Disk Award for a NewComer act with my girls in 4minute, but I'm still a bit unsure as to whether I want to label myself as a fan of theirs or not. They're TVXQ internationally. Tohoshinki in Japan. Lol. But otherwise, nailed it. Again. I don't like T-ara either. Bleh. Yay for TVXQ, SuJu, SNSD and 2NE1. I don't really pay attention to the others. BTW, seriously Mel, where is Big Bang? Nikki - ;) Like I said earlier, the jury's still out on T-Ara. Loy - :) Yays! You don't like 4Minute? I think they're super cute! ;) Yes, yes, yes, I know. I'm still getting in to Big Bang and 2PM. In terms of artists I listen to the most, the ones I listed are it. Do you have any suggestions on your favorite Big Bang songs for me to listen to? Mel, I like 4Minute's What A Girl Wants for a while but after that the sizzles died. Hahaha. i feel so educated! You and Nikki are expanding my horizons!! Big Bang? hmmm. I don't like GD alone and they do have some brilliant material but they're like 2NE1 - you have to watch them in action. They're competent recorded, Daesung has the most gorgeous voice ever, but live it's just different. Hahah. They are YGE, after all.